Hydration for Endurance Sports | Run Inspired. With regards to hydration, the recommendation that athletes are most familiar with is, if you wait until you are thirsty, then you’ve waited too long. You are already in a state of dehydration. Also, if you lose more than 2% of body weight, you are losing too much fluid and hence decreasing performance. However, when Haile Gebrselassie set the world record for the marathon, he had lost 10% of his body weight, and it is common for those who finish first in long distance events, finish in a dehydrated state. The people who tend to over-hydrate (hyponatremia) are those middle and back of the pack runners. Dr. Noakes argues that the common advice to drink before you get thirsty and drink to prevent dehydration may sometimes result in over-drinking, with hyponatremia (when fluid intake exceeds your rate of fluid loss from sweating, resulting in low blood-sodium levels) as the consequence. Throughout the history of hydration guidelines, there have been changes from not drinking anything, to drinking as much as possible, to most recently, drink when you are thirsty. Certainly, there are times when we need to drink more than others – such as in high heat and humidity. However, I am often of the mindset that I should drink at aid stations, regardless of the fact of if I’m thirsty or not. According to the International Marathon Medical Directors Association’s (IMMDA) latest revision, this really isn’t necessary. In 2006, IMMDA released its long-awaited hydration guidelines, which concluded that runners should, simply, drink when thirsty. This weekend, along with my beet juice pre-race beverage, I’m leaving the handheld at home. Instead, I’m leaving the water bottle in the car and running a loop where I can easily get to it when I start to get thirsty. What are your thoughts about this approach to hydration? 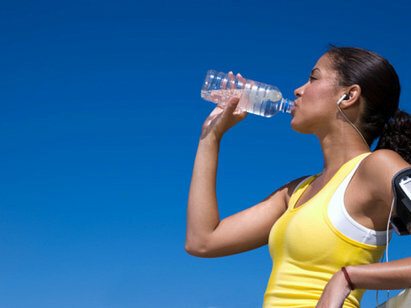 Do you drink when you’re thirsty or drink to prevent dehydration? This is really interesting… I get those blue lips from the cold, too. 🙂 I rarely hydrate on a run unless it’s over 15 miles. And I don’t use salt or anything targeted at runners, just plain old water. 🙂 Mostly out of laziness… but it’s nice to see some support for this minimalist approach! Hi Laura! Good to know someone else suffers from the blue lips =) I was actually pretty surprised about the change in hydration guidelines as well, but the science makes sense. I’m heading out for 15 miles tomorrow so I’m going to see just how minimalist I can go.